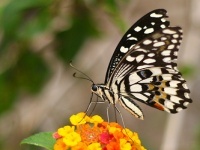 Located in the Basak district, this private museum, art gallery and miniature nature reserve was created by late lepidopterist, Professor Julian Jumalon, and houses his impressive butterfly collection and the art he created. The collection is fascinating and is considered the oldest and largest collection of its kind in the country. The most popular art is the collection of unusual mosaics which are made up of butterfly wings and depict scenes and people from Cebu. The highlight for many visitors, however, is the outdoor section, where there are lovely live specimens flitting about. The garden is full of plants that attract butterflies and some species have been released into the grounds, or bred in captivity. Today there are around 50 species of butterfly fluttering around in the garden, some local and some foreign. Be sure to bring a camera and to wear a lot of perfume as it supposedly attracts the butterflies. Make sure you aren't wearing any insect repellant. There are guides available to show visitors around and they help to create some amusing photo opportunities. The guided tours are free but tips are appreciated. Unusual and fascinating, the Jumalon Museum is a great attraction in Cebu City.